Popcorn Granny Square Scrubber -- $1.99 A Crochet pattern from Julie A Bolduc. This little scrubber pattern could do double duty! 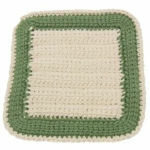 Not only is it a great little scrubber, but if you made this square with acrylic worsted weight yarn, you can use it as a motif in an afghan. This would be a great way to use up your scraps! You could also make a pillow with 9 of these squares sewn together.